This is cool and all, but what happened to the Stack 2.1 update???? I'm not going to try and bother Ste with packaging and setting up the distribution of Stack 2.1 over Christmas, it's rude and selfish. Let me just put this out there... but you just got Steven Troughton-Smithed. In the face. I really appreciate your Speed app, although I've had some trouble with its accuracy. Most recently, with the new 1.0.5 that has it working again, the numbers seems to be about 10% too high to me. When I was driving along at 70-72 mph, it was showing 77-80 mpg. Any idea why? I confirm the issue fredct experienced in v1.0.5. The speed appeared roughly 10 km/h (or 6 mph) higher than I actually drove. The speed bug fixed, the decimal option added, this application rocks! I have an update waiting in the store that hopefully will tune the readings even further. The iPhone 2.2 firmware is still broken, and until it's fixed I can never make this as accurate as it used to be. do you can make a black Screen and big White Numbers? 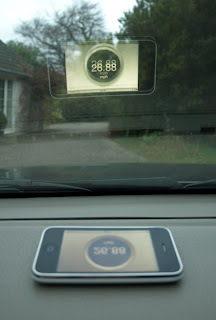 And in Headupdisplay mode can be show the Speed Slower. But when it is jumped jo look to much inside. I agree that the decimal places aren't all that meaningful due to the accuracy of the iPhone GPS (especially two of them). Maybe a setting for 0, 1, or 2 decimals wouldn't be a bad choice. Afterall, if we know its wrong by 6 to 7 mph, whats the point of 0.01 mph displays? But more important than that, I think the frequency of changing might be an issue. The old versions seemed up update your speed only once every, what was it, 5 or 10 seconds if that? The new one seems to update once a second or so. Is there any chance that - again, due to the low accuracy of the iPhone GPS - the answer might be more accurate if it didn't update so often? Perhaps taking the reading less often would allow some of the error to average out? Maybe a second user option for updates every 1..10 seconds would be useful too.